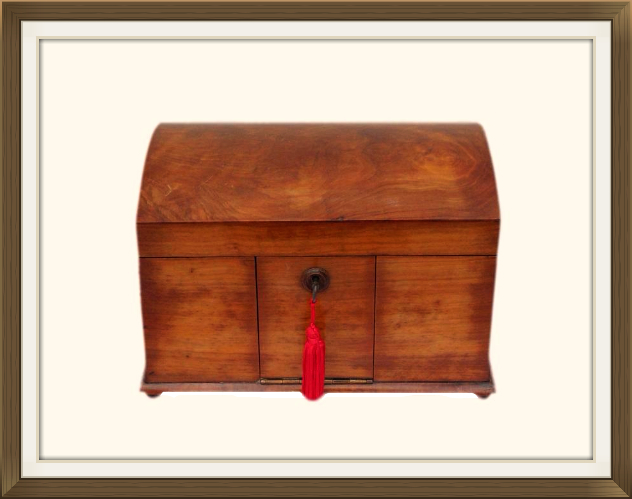 This is a beautiful antique jewellery box, dating to 1900/1910. 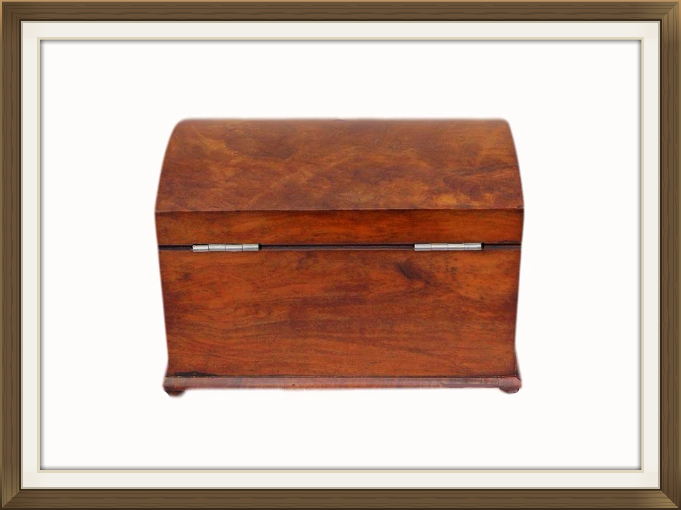 It is made of solid Olive Wood and has a beautiful Walnut veneer to the exterior. 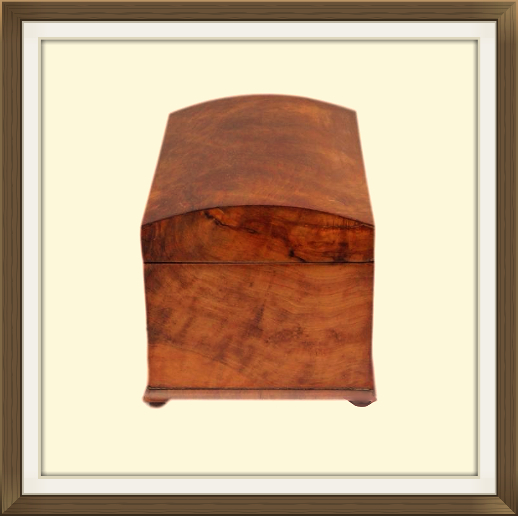 The Walnut has a lovely warm colour and beautiful figuration. 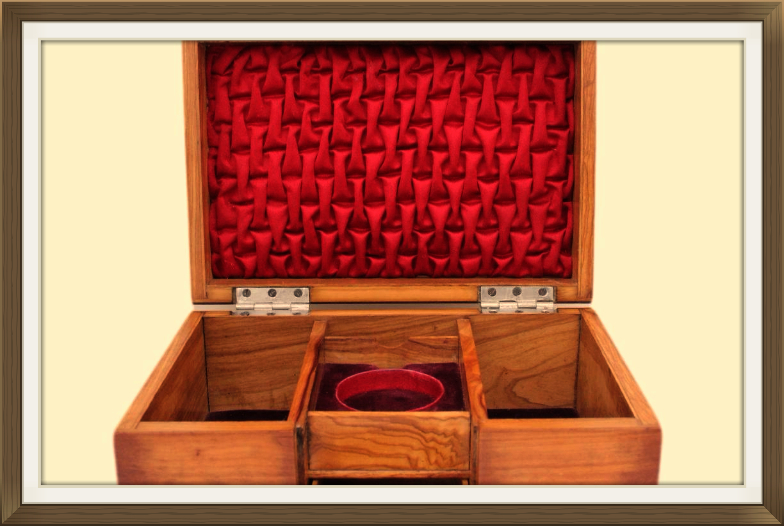 The Olive Wood with its wonderful characteristic figuration, can be seen when you look inside the box. There is a description about Olive Wood further down this page. 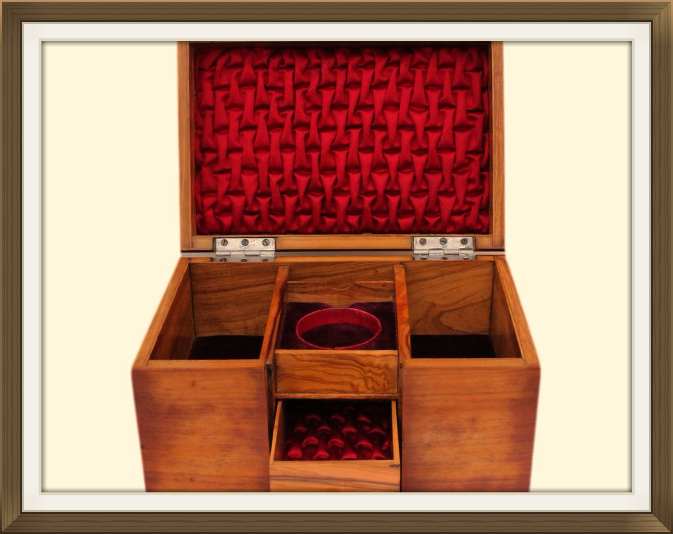 The lid has a beautiful, stylish domed form, and the box has a lovely casket design. It stands slightly raised on its original turned ball feet. The Walnut exterior is beautifully polished and has a lovely sheen. The interior Olive Wood has been lightly polished. 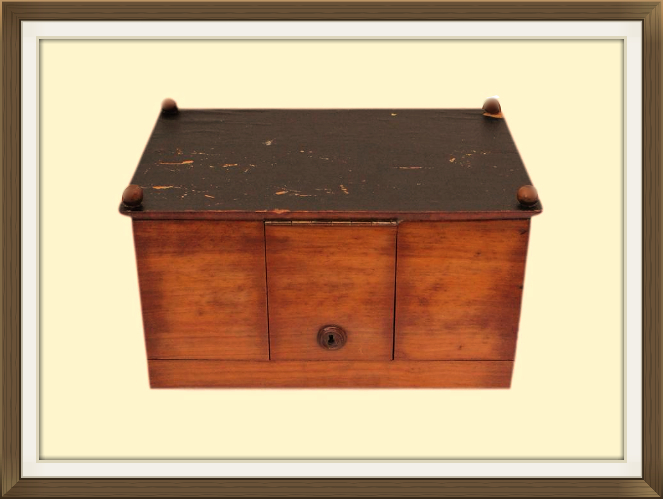 The box is complete with its original hinges, and its original lock and key. It also has its original thin leather covering on the bottom. The Olive Wood interior has been constructed to form 4 separate compartments, and a sweet little storage drawer. The drawer is concealed in the base of the box, beneath the centre top storage compartments, and behind the drop down flap to the front of the box. The keep to the lock is on this flap. The centre front compartment has a circular ring section which was originally designed to hold a pocket watch. This would now look beautiful with a pendant or locket inside it, and a bracelet would look lovely draped around it! 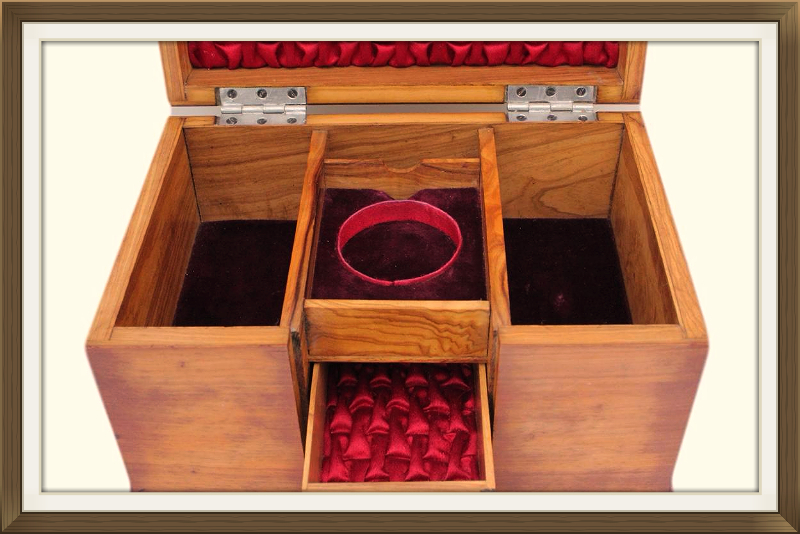 Behind this compartment is a small sweet compartment which is the ideal size for little pieces of jewellery such as rings and small stud/hoop earrings etc. There are two larger and deeper, roomier compartments, on either side of those in the centre. These are big enough to hold necklaces, slender bangles and bracelets, and slender watches. The charming little drawer beneath is perfect for pendants, rings, earrings, neck chains, chain bracelets, and slender bracelets and bangles. 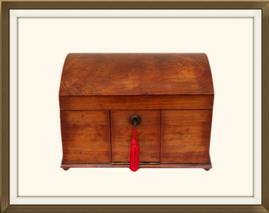 There are beautiful textured, red satin panels, to the inside of the lid and the storage drawer. 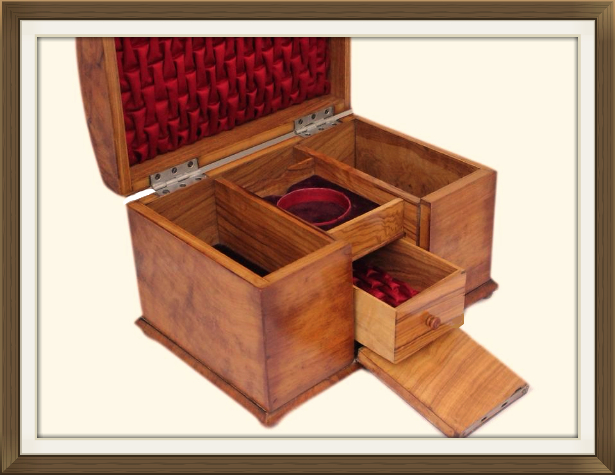 All of the bases of the storage compartments are lined with maroon red velvet. 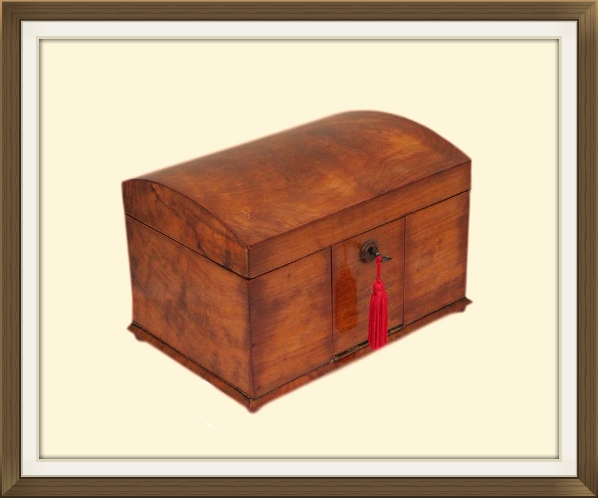 This wonderful box is in excellent condition for its 100 plus years of age. The lid has some extremely light, superficial surface scratches, and a teeny nick to the front edge. This has been polished smooth and is not very noticeable. The interior satin panels are in amazing condition with very little wear. The velvet linings are also excellent, with just one small patch of wear to that in the compartment on the right. There is wear to the leather covering on the bottom of the box, as we'd expect from age and handling. This cannot be seen unless you turn the box over. Please see the last image above. 12 by 5.5cm with a 5.3cm depth. 8.0 by 6.5cm with a 4.5cm diameter and 1.0cm depth to the circular centre. 6.5 by 2.0cm with a 2.3cm depth. 10.0 by 6.0cm with a 3.3cm depth. International postage is £25 by Royal Mail International Tracked. Delivery is fast, within 5-7 working days.